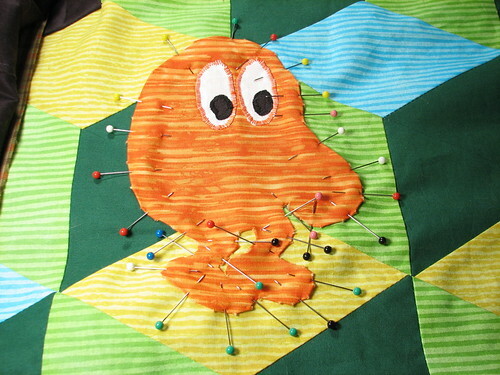 QuiltBert is based on the traditional tumbling blocks pattern and the video game Q*bert. 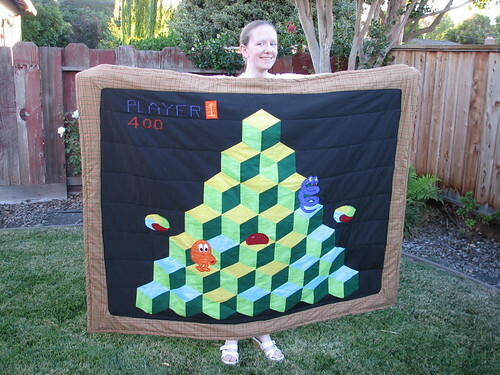 It is a lap-sized quilt, ideal for hanging out on the couch playing vintage video games. 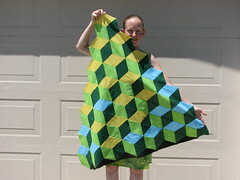 A while back, our junior mad scientist brought home a geometry / art assignment from school based on designing a quilt. The kids were given a small grid which they filled in with a pattern. They then rotated and copied the pattern several times into a larger grid. His design looked like it would be very complicated to make into a real quilt, with curved pieces, applique and embroidery all needed. That started us all looking at quilt patterns so he could get an idea of what goes into making a quilt. 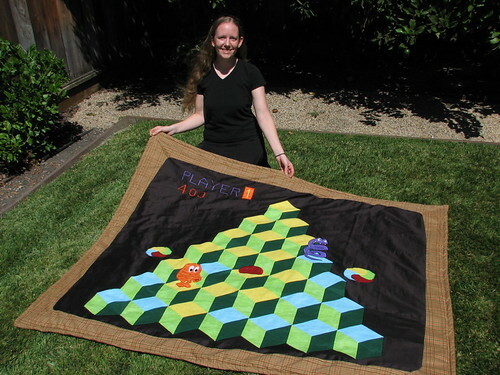 When we found the “tumbling blocks” quilts which are made with rhombi the question came up as to whether anyone had ever made a Q*bert quilt. 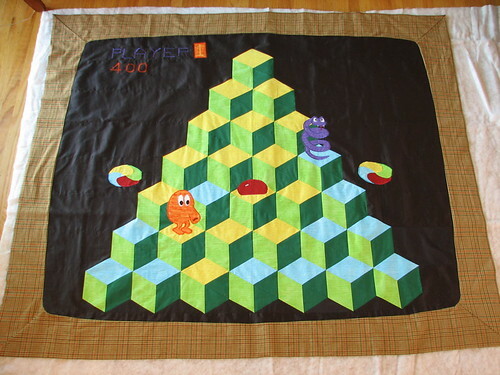 Although there are many tumbling block quilts that are referred to as Q*bert quilts, we couldn’t find any genuine Q*bert quilts. We did find Tetris, Space Invaders, and Mario, Mario, Mario, and more Mario. Also the tangentially related but incredibly inspired Color Bars quilt. 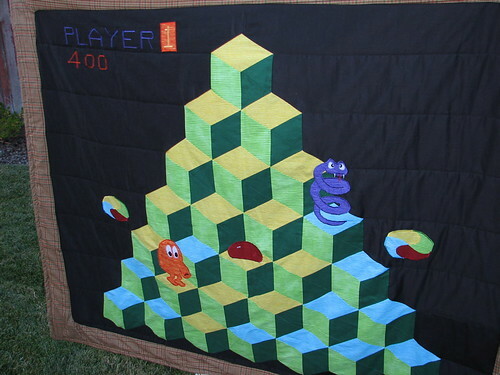 Clearly, someone needed to make a real Q*bert quilt. We played a couple rounds of Q*bert on an arcade emulator to get some good screenshots. We liked the color scheme on level 1 best, so that’s what we went with. We even found some fabulous striped fabrics that we thought would give the idea of CRT scan lines. We used a graph paper generator for making the pattern. Sitting down with the screenshots and graph paper, we came up with a rough outline. We started out using cardboard templates for cutting the pieces, but they began to show a bit of wear. We replaced them with PCB templates for better durability. 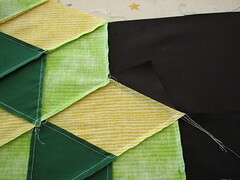 Rather than use the traditional and likely tedious tumbling block quilt, a minor pattern change allowed the pieces to be sewn into strips that were later sewn together. The shadowed side of the cubes started out as triangles rather than rhombi. The strips were pinned together. And then sewn starting with a lower corner of the pyramid. 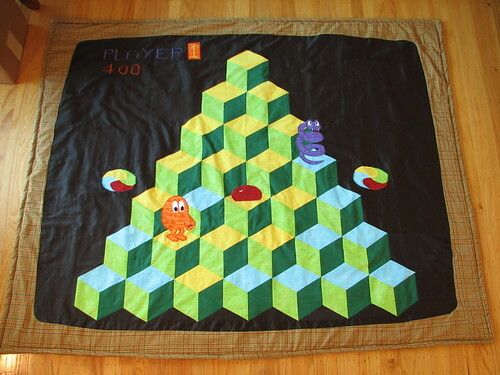 The first part done was the pyramid that Q*bert moves around on. The dark part of the screen was made of strips of black material cut horizontally to reinforce the CRT lines. The pattern for the applique pieces was drawn on freezer paper (backwards) and ironed onto the fabric for cutting and ironing the edges down. 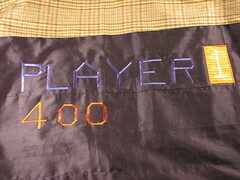 The freezer paper was removed and some additional details were added prior to putting the pieces on the quilt. 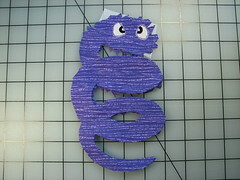 The discs were pieced together prior to being appliqued. 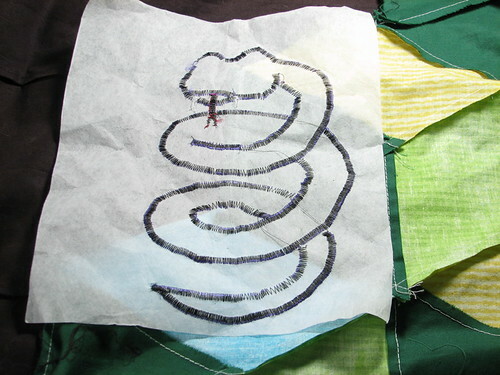 The pieces were pinned to the quilt before using a reasonably tight zigzag to be stitched down, forming a cartoonish outline with shiny embroidery thread. 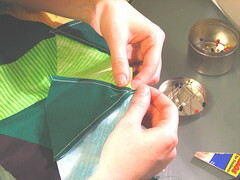 Tear-away stabilizer was used underneath all of the applique and embroidery. 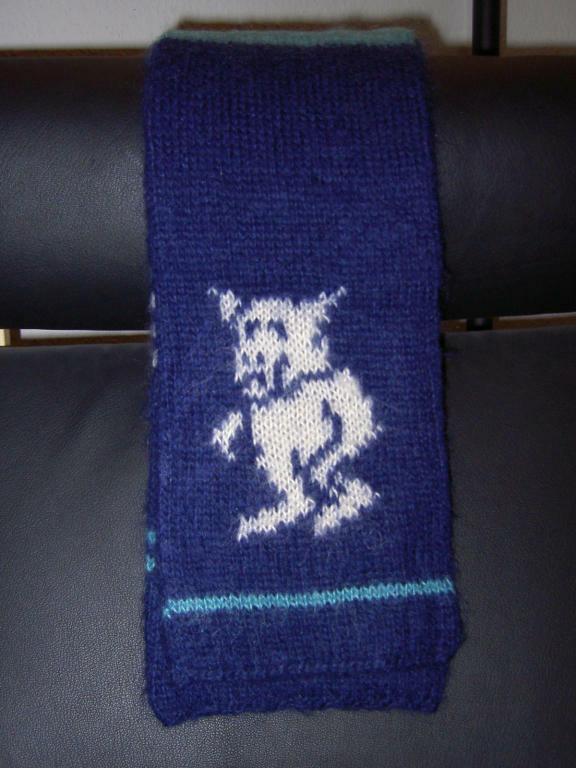 After stitching the piece down, additional embroidery details were added, such as the tongue and teeth shown here. The result was quite satisfactory. 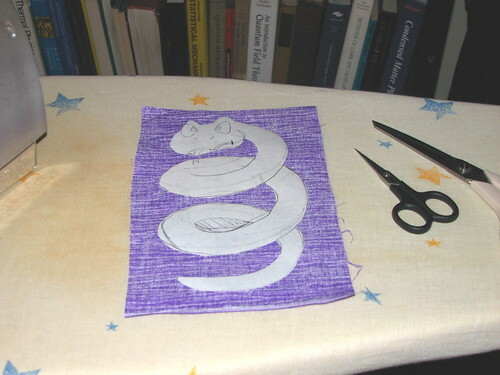 The score was drawn onto the fabric with a pencil and then traced over using a zigzag stitch. The screen area was bordered with a very soft brown plaid flannel reminiscent of 1970’s television sets. 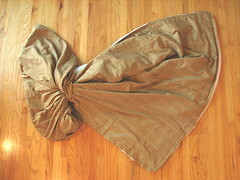 The back was made with the same material. After spreading it over the batting and the top, the layers were pinned together, the edges were trimmed, and then they layers were sewn together around the edges. A gap was left at the bottom for turning it right-side-out. The whole thing was turned right-side-out. 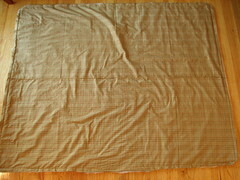 And the edges were quilted down. 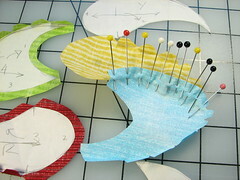 Some very simple machine quilting was added along the horizontal lines and around the edge of the screen. 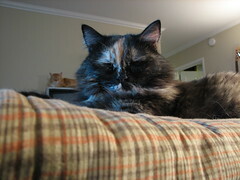 The finished quilt is super comfy – even Harley cat approves! 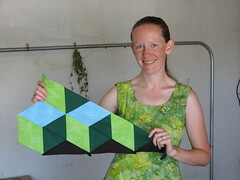 This entry was posted in Art, EMSL Projects and tagged art, quiltbert. Bookmark the Permalink. 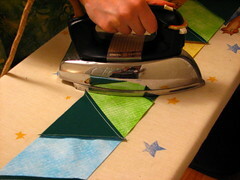 I can remember many fun afternoons and evenings quilting with my grandmother. Hey, stop looking at me like that. 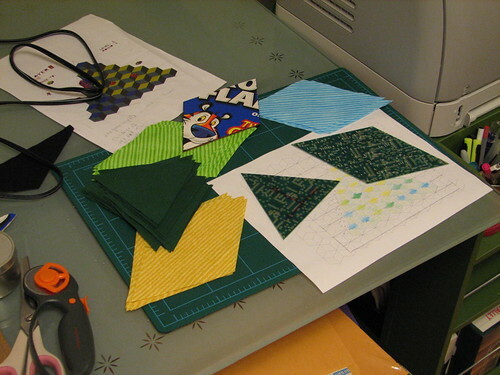 So what if a young boy enjoyed quilting with his grandmother. Besides, how many 47 year old guys can point to the quilt on their bed and say that they made it? Great quilting work! It’s gorgeous! I think this is the greatest quilt I have ever seen. I never had Q bert, but my friend did and we would play for hours. You did such a great job! This is neat. Cute girl. 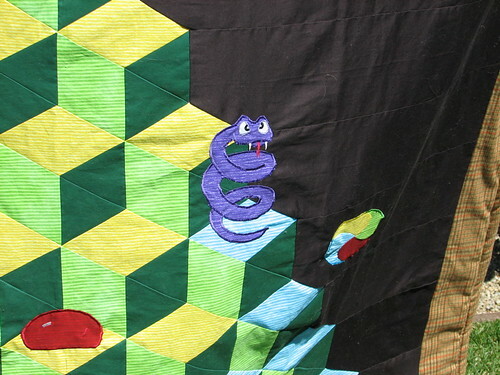 as a present for me with the werewulf from "knight lore"
This quilt is totally amazing. Love, love, love it!